Chief Executive Officer (CEO) of Unity Group of Companies, parent company of Unity Oil, Dr Kwame Kyei, has been awarded an Honorary Professorship Degree by the Alfred Nobel University of Ukraine. The degree was conferred on the Unity Oil boss, now referred to as Prof. Kyei, on Saturday, August 4, 2018, in the Bank of Ghana (BoG) auditorium at the University of Ghana, Legon. It was in honour of his selfless contributions towards women empowerment and fight against poverty in Ghana and across Africa. The award is the first of its kind to be presented to a black person on the African continent, and was done under the auspices of the Ukrainian Ministry of Education. It was presented by Professor Eugene Cronoff, Dean of Research and Development of the Alfred Nobel University. Three other personalities, namely Emmanuel Bortey Borketey, CEO of Happy Man Bitters; Dr. K.K. Peprah, Managing Director of K.K. 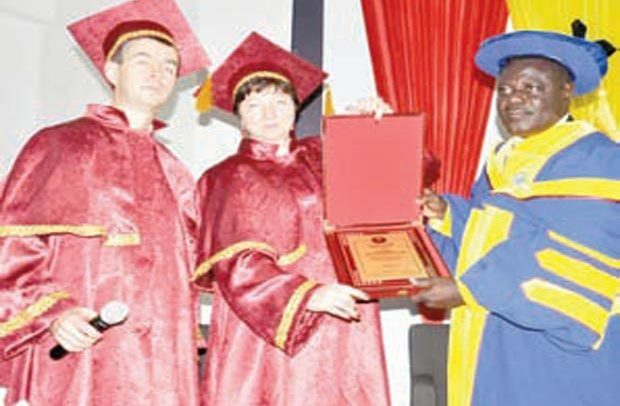 Peprah Company Limited and Fadda Dickson Narh, Managing Director of Despite Media Group, were also awarded doctorate degrees during the awards ceremony organized by Confederation of Governance Assessment Institute (COGAI) and the Bureau of Research and Governance Commerce and Administration (BORGCA). Touching on the criteria for conferring the Honorary Professorship Degree, Director in-charge of Strategic Communications, Business and International Relations, COGAI, Isaac Rockson, said by all assessments carried out, the Unity Group CEO was deserving of the honour done him. According to him, “Per the research done on Dr. Kwame Kyei; first of all, we looked at somebody who has been empowering women in terms of employment, and per our research, Dr. Kyei is the first Ghanaian that had the audacity to employ more women at his filling stations and kept employing more women in his businesses. Prof. Kyei, the first blackman to have received such an award, was also honoured for his many years of contributing immensely to the development of Christendom and promotion of peace in Ghana. Commenting on the awards, Prof. Cronoff indicated that the performance of Prof. Kyei to socio-economic and religious development over the years has been outstanding. It was his expectation that the award would spur on the Ghanaian businessman, who doubles as Chairman of Asante Kotoko Football Club, to win more awards in the years ahead. Dr. Borketey, who spoke on behalf of the other awardees, thanked the Alfred Nobel University for the honour done them and was hopeful they would continue the good works for the development of Ghana. Alfred Nobel University is a higher education institution in Ukraine with the IV level of accreditation. It’s committed to enhancing innovative technologies in teaching, helping to strengthen the European nation’s position across the globe.